The Royal Rumble is only a few short months away. 2018 has flown by so fast. 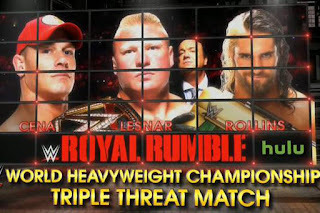 However, the history of the matches at the Rumble are all solidified, including the matches that are not the main focus. One star who has had some success at the Rumble is John Cena, a legend in his own right. Today, we look at Cena's top 5 matches at the classic PPV. Which matches are here? Let's find out. -So, there are a number of matches that Cena has been in, that I could have selected, but for me, this is probably the one that many hold in high regards outside of the obvious. Cena spent a number of years wrestling in the actual Rumble so those don't count, but for all his one on one or triple threat contests, this is the one that makes the top 5 barely. Edge and Cena had solid chemistry in the ring, but their feud was just really starting to begin, and as a result, you would see them slowly getting familiar with each other in the ring more. The match went about 15 minutes and as expected, the crowd was once again divided between these two. I didn't like the ending because Edge tapping out was probably the wrong move, but it was clear that WWE was building to Cena vs Triple H, so this was expected. A solid match, just nothing too special compared to the others on the list. -The fans were essentially not happy about this match taking place. Truthfully, the WWE should have did what made the most sense. It should have been CM Punk vs Randy Orton with Punk defeating Orton and Bryan winning the Rumble. However, WWE was not in their right mind as usual, and we got this match instead. What sticks out about this however is the fact that this match was actually really good. Cena and Orton have had decent chemistry over the years, and this was no different. Anytime Orton and Cena can turn a crowd from being bored and booing to invested and cheering, this is a success. 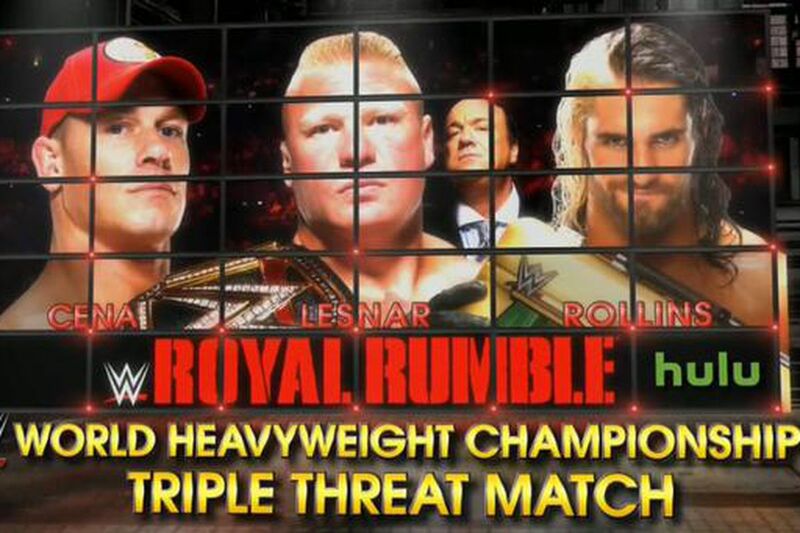 Cena would come up short in this match, but nonethelss, he could add this match to his collection of good ones on PPV. -Anytime we see the stipulation Last Man Standing, we always know what to expect. It is usually brutality, aggression, and sometimes blood. This match had everything you could hope for. It made Umaga look like a monster while still making Cena look strong as always, but I had no issue with the booking of this match. Umaga looked solid, Cena looked solid, and for nearly 25 minutes, these two ripped each other apart. Cena walked away victorious, but he would never really be the same again due to this match taking so much out of him. -So, the Rumble. 2017. Cena going after another title to break a record that shouldn't be broken. How does WWE book him? To win another title. Still, despite the terrible outcome, this was a great match and had both men at the top of their game. While I personally would prefer their Summerslam match to this one, but this is a very good match. AJ steals the show alongside Cena and they create a classic for the ages. Like most of his matches as time progressed, Cena would be in control and put a pointless end to the momentum that AJ was building. While AJ would bounce back soon enough, this match would see a small fall for him, as Cena used a multitude of finishers and aggression to win the match and the WWE Title, ending the reign of AJ Styles, a top wrestler in his era. -This was an easy choice for me. Cena, Rollins and Lesnar really went above and beyond for this match and this is a true classic. Brock was in need of a big match and Rollins needed a star making turn and this was the match to do it in. Brock, Rollins, and Cena gave us a classic that saw Seth steal the show, Cena show up as well, and for Brock to have perhaps his best match in the WWE since returning. That match was perfection in the ring and mo one expected Brock to lose, thus, the result of the match was fine. When talking Cena at the Rumble, no match is better than this one by far..
Odessa Uluslararası Humaniter Üniversitesinde bologna eğitim sistemi ile beraber İngilizce, Rusça ya da Ukraynaca dilleri ile beraber eğitim verilmektedir. Odessa Uluslararası Humaniter Üniversitesinde dahilinde yer alan bu eğitim sisteminde öğrencinin araştırmacı bir kişilik kazanması temel prensiplerden biri olarak benimsenmiştir. Bütün dünyanın ön görmekte olduğu eğitim sistemi olarak kendini sürekli olarak geliştirmekte olan Bologna eğitim sisteminin Odessa Uluslararası Humaniter Üniversitesinde dahilinde uzun yıllardan beri kullanılıyor olması bu alanda verilmiş olan mezunların yaptığı çalışmalar ile beraber Odessa Uluslararası Humaniter Üniversitesinin başarısını gözler önüne sergilemektedir.